HELSINKI, Finland -- The Trump administration still has no firm commitments from the biggest Iranian oil importers that they will wean themselves off that supply to comply with sanctions being reinstated by the U.S. as part of its withdrawal from the Iran nuclear deal. Secretary of State Mike Pompeo has had personal discussions with top officials from many of those countries on how to make the U.S. plan work. The first deadline for companies to sever their economic engagement with Iran -- or find themselves in violation of U.S. sanctions -- is next month. "They have a commitment, they understand where we're headed," Pompeo said of countries that the U.S. has asked to cut off economic relations with Iran. "What they've asked us to do is review how we get there and the timeline for that." 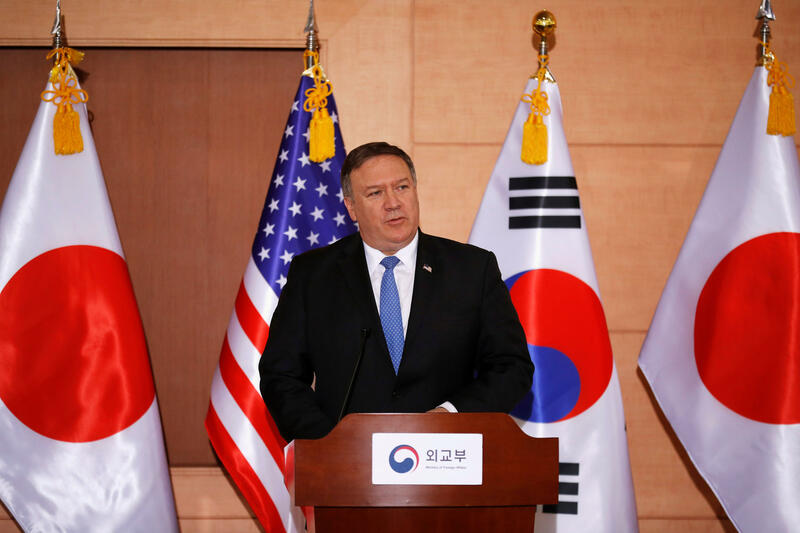 Pompeo was specifically referencing discussions with Asian allies which are major Iranian oil importers, namely South Korea, China, India and Japan. But he added that it is not just about oil, but rather forcing an end to economic activity with Iran on a "bigger and broader" spectrum. State Department officials are still working with allies on how to implement the reinstated sanctions on Iranian oil exports without throwing the global oil supply into a frenzy. Last week, U.S. officials met with counterparts in Saudi Arabia to discuss the possibility of that nation increasing its oil output to fill the void that would be created if the Trump administration succeeds in weaning allies off Iranian oil. The negotiations are a result of the U.S. government pulling out of the Iran nuclear deal, formerly known as the Joint Cooperative Plan of Action (JCPOA) earlier this year. Europeans have committed to work to maintain the nuclear agreement, despite the U.S. withdrawal. European officials met with Iranians earlier this month to try and maintain a dialogue. Pompeo: Iran to face "strongest sanctions in history"
"We went to Saudi Arabia to coordinate stronger pressure on Iran. We discussed new ways to deprive the regime of revenues to terrorize people and to terrorize other nations," a senior State Department official told CBS News. The official said the meetings show that the U.S. and its partners are "working very well together" to push back on Iran. Iran "should know that America is committed to keeping sea lines open, keeping the transit of oil available for the entire world," Pompeo told Sky News last week. "That's the commitment we have had for decades. We continue under that commitment." With the snapback of sanctions drawing near, Treasury Secretary Steve Mnuchin reiterated that there would be no general waivers issued to companies or nations that want to keep buying Iranian oil or keep other trade deals alive. He said situations would be considered on a "case by case basis," but that so far there have been no exemptions agreed. European countries say they have had no indication that there will be carveouts for specific industries. They face that reality despite writing a letter to Pompeo and Mnuchin in June seeking a means to keep economic relationships in certain industries with Iran viable. They pointed specifically to the healthcare, automotive, civil aviation and infrastructure sectors. The Trump administration has maintained stern rhetoric on Iran since pulling out of the JCPOA. Earlier this month, after the Belgians said they had foiled a plot involving two people, one of them an Iranian diplomat, to attack a meeting of Iranian opposition leaders in Paris, the State Department accused Tehran of using its embassies to plot terror attacks. The State Department official did not list other places where such attacks could be in the works, but urged the world to remain hyper-aware. "If Iran can plot bomb attacks in Paris, they can plot bomb attacks anywhere in the world," the official said.